Plover, WI – April 9, 2019 – Although women comprise just under eight percent of the driver population, that number is steadily increasing as more females are getting behind the wheel. 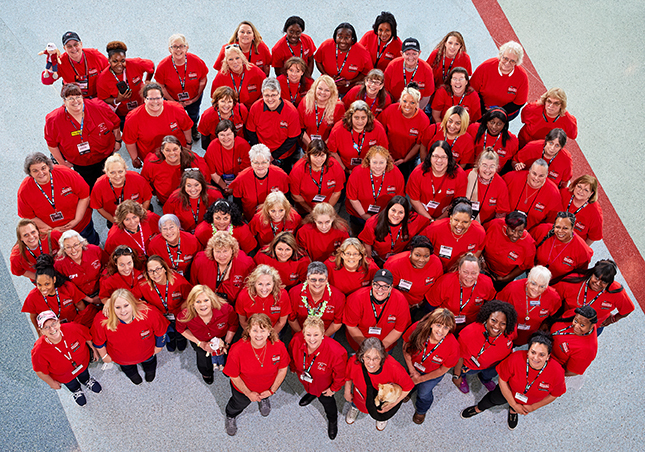 Part of the Women In Trucking Association’s (WIT) mission is to encourage and support these pioneers and celebrate their success and achievements. Ten years ago, in honor of this mission, WIT created the “Salute to Women Behind the Wheel” ceremony to recognize and honor female drivers for their service and commitment to the industry. This year’s event took place Saturday, March 30 at the Mid-America Trucking Show at the Kentucky Exposition Center in Louisville, Kentucky. Between 115 female drivers, they tallied nearly 1,700 collective years of driving and several women were recognized for driving careers spanning forty years or more! The celebration included valuable self-defense demonstrations by Debbie Gardner of SURVIVE Institute and LIFELITE’s PepperBall Launcher, a live broadcast of the Women In Trucking show on SiriusXM’s Road Dog Channel 146, a high-energy performance from Jayne Denham, an award-winning singer and song writer from Australia, delicious chocolate fountains, and the iconic truck-shaped cake. The Women In Trucking Scholarship Foundation gave away numerous prizes and raised $2,443 in donations from the attendees, which was matched by UPS. In addition, the Women In Trucking Foundation received a $5,000 donation from UPS and a $25,000 donation from Ryder to support its efforts in bringing more women into the industry through their scholarship program. Landstar took home the Driver Participation award with the most female drivers present. The event also included the annual group photo of the women in their WIT red t-shirts and ended with the distribution of goodie bags filled with items from the event sponsors. Copper: J. J. Keller & Associates, Inc.